Federal judge appears ready to trim millions from Apple’s $1 billion jury verdict over Samsung. SAN JOSE, Calif. – A federal judge appeared ready to trim millions from a $1.05 billion jury verdictApple Inc. won over Samsung Electronics this summer as she urged the top two smartphone companies to settle their myriad legal actions around the world. U.S. District Judge Lucy Koh said Thursday she would issue a series of rulings over the next several weeks resolving the many legal issues raised at the hearing Thursday. Samsung is seeking a new trial or a reduction of the verdict that resulted from a lawsuit Apple filed in 2011. Apple, on the other hand, urged the judge to add millions more to the award and permanently ban the U.S. sales of eight Samsung smartphone models a jury in August said illegally used Apple technology. Koh gave no indication on how she would rule on the sales ban request nor by what amount she would cut from the $1 billion award. Samsung was demanding that she cut the award by more than half, but Koh gave no hint that she sided with that argument or Apple’s separate argument for an increase in the award. Apple filed a second lawsuit earlier this year, alleging that Samsung’s newer products are unfairly using Apple’s technology. That’s set for trial in 2014. In addition, the two companies are locked in legal battles in several other countries. “I think it’s time for global peace,” Koh said at an end of a nearly four-hour hearing in San Jose. Lawyers for each company responded by casting aspersions on the other side. Apple lawyer Harold McElhinny claimed that Samsung “wilfully” made a business decision to copy Apple’s iPad and iPhone, and he called the jury’s $1.05 billion award a “slap in the wrist.” McElhinny said Apple intended to keep on fighting Samsung in court until it changed its business ways. In turn, Samsung lawyer Charles Verhoeven responded that Apple was attempting to “compete through the courthouse instead of the marketplace.” He said Apple wants to tie up Samsung in courts around the world rather than competing with it head-on. In the third quarter of 2012, Samsung sold 55 million smartphones to Apple’s 23.6 million sales worldwide, representing 32.5 per cent of the market for Samsung compared with Apple’s 14 per cent. Earlier in the hearing, Koh appeared ready to rework some of the jury’s damage calculations. The jurors filled out a verdict form listing the amount of damages Samsung owed Apple for 26 separate products. For instance, the jurors said Samsung owed Apple nearly $58 million for sales of its Prevail smartphone found to have used Apple’s “tap-and-zoom” technology. But the type of patent violation the jury found doesn’t lend itself to that big of an award for the product, Koh said, musing that it appeared that Apple could recover perhaps $8 million over the Prevail dispute. That was just one of 26 line items Koh is reviewing when it comes to considering the jury’s $1.05 billion verdict. She is also considering Samsung’s demand for the verdict to be completely wiped out and for a new trial to be held. Samsung raises a host of legal issues in arguing it was deprived of a fair trial in a courthouse a dozen miles from Apple’s Cupertino, California, headquarters. One of it arguments is that jury foreman Velvin Hogan committed misconduct when he didn’t divulge he had been sued by his former employer, Seagate Technology, in 1993. Samsung is a large investor in Seagate. Koh showed no indication of what she thought of the argument, and most legal experts said Samsung had no chance of prevailing on that issue because it happened more than 20 years ago and Hogan wasn’t specifically asked about it. Koh’s decision will help shape the ultimate result of the case, but this bitter legal battle is expected to land before the U.S. Court of Appeals for the Federal Circuit, the Washington, D.C.-based court that decides patent disputes, if not the U.S. Supreme Court. Apple reveals iPad Mini for $329 and up. SAN JOSE, Calif. (AP) — Apple Inc. on Tuesday revealed a smaller version of its hit iPad tablet computer that will start at $329 and comes with a screen that’s about two-thirds the size of the full-size model. Apple starts taking orders for the new model on Friday Oct. 26 and will ship the Wi-Fi-only models on Nov. 2, said marketing chief Phil Schiller at an event in San Jose, Calif. Later, the company will add models capable of accessing “LTE” wireless data networks. The iPad mini weighs 0.68 pounds, half as much as the full-size iPad, and is as thin as a pencil, Schiller said. The screen resolution is 1024 by 768 pixels, the same as the iPad 2 and a quarter of the resolution of the third-generation iPad. “It’s not just a shrunken down iPad, it’s an entirely new design,” Schiller said. Company watchers have for a year been expecting the company to release a smaller iPad to counter cheaper tablets like Amazon.com Inc.’s Kindle Fire. However, most were expecting it to cost between $250 and $300. At $329, it’s twice the price of the basic Kindle Fire. In a surprise, Apple also said it’s upgrading its full-size iPad tablet just six months after launching a new model, doubling the speed of the processor. Previously, the company has updated the iPad once a year. The fourth-generation iPad will have a better camera and work on more “LTE” wireless data networks around the world. Apple is also replacing the 30-pin dock connector with the new, smaller “Lightning” connector introduced with the iPhone 5 a month ago. The price of the new full-size model stays the same as the previous version, starting at $499 for a Wi-Fi-only version with 16 gigabytes of memory. Svensson contributed from New York. Apple’s $1B patent verdict could corner market. SAN JOSE, Calif. (AP) — It was the $1 billion question Saturday: What does Apple Inc.’s victory in an epic patent dispute over its fiercest rival mean for the U.S. smartphone industry? 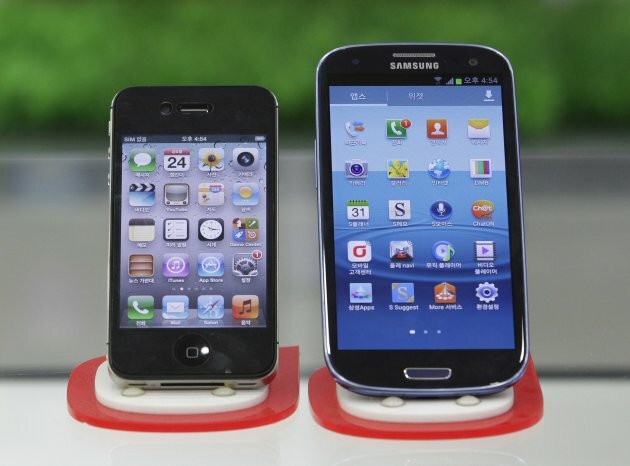 Analysts from Wall Street to Hong Kong debated whether a jury’s decision that Samsung Electronics Co. ripped off Apple technology would help Apple corner the U.S. smartphone market over Android rivals, or amount to one more step in a protracted legal battle over smartphone technology. Many analysts said the decision could spell danger for competitors who, like Samsung, use Google Inc.‘s Android operating system to power their cellphones. The Silicon Valley jury found that some of Samsung’s products illegally copied features and designs exclusive to Apple’s iPhone and iPad. The verdict was narrowly tailored to only Samsung, which sold more than 22 million smartphones and tablets that Apple claimed used its technology, including the “bounce-back” feature when a user scrolls to an end image, and the ability to zoom text with a tap of a finger. But most other Apple competitors have used the Android system to produce similar technology, which could limit the features offered on all non-Apple phones, analysts said. “The other makers are now scrambling” to find alternatives, said Rob Enderle, a leading technology analyst based in San Jose. Seo Won-seok, a Seoul-based analyst at Korea Investment said that the popular zooming and bounce-back functions the jury said Samsung stole from Apple will be hard to replicate. The companies could opt to pay Apple licensing fees for access to the technology or develop smarter technology to create similar features that don’t violate the patent — at a cost likely to be passed onto consumers. Apple lawyers are planning to ask that the two dozen Samsung devices found to have infringed its patents be barred from the U.S. market. Most of those devices are “legacy” products with almost nonexistent new sales in the United States. Apple lawyers will also ask that the judge triple the damage award to $3 billion since the jury found Samsung “willfully” copied Apple’s patents. A loss to the Android-based market would represent a big hit for Google as well. Google relies on Android devices to drive mobile traffic to its search engine, which in turn generates increased advertising revenue. Android is becoming increasingly more important to Google’s bottom line because Apple is phasing out reliance on Google services such as YouTube and mapping as built-in features on the iPhone and iPad. Some experts cautioned that the decision might not be final, noting the California lawsuit is one of nine similar legal actions across the globe between the two leading smartphone makers. Samsung has vowed to appeal the verdict all the way to the U.S. Supreme Court, arguing that Apple’s patents for such “obvious” things as rounded rectangle were wrongly granted. A Sept. 20 hearing is scheduled. The $1 billion represents about 1.5 percent of Samsung’s annual revenue. Jerome Schaufield, a technology professor at the Worcester Polytechnic Institute said the verdict wouldn’t upend a multibillion-dollar global industry. Samsung engineers have already been designing around the disputed patent since last year. The dispute centers on Apple’s dissatisfaction with Google’s entry into the phone market when the search company released its Android operating system and announced any company could use it free of cost. Google entered the market while its then-CEO Eric Schmidt was on Apple’s board, infuriating Apple co-founder Steve Jobs, who considered Android to be a blatant rip-off of the iPhone’s innovations. Apple filed its patent infringement lawsuit in April 2011, engaging the country’s highest-paid patent lawyers to demand $2.5 billion. The verdict didn’t faze some iPhone users, who said that they already know Apple phones are superior. The rivals are “modeling phones based on what they see with the iPhone,” said David Green of Wareham, Mass., finishing a call on his iPhone while waiting to catch a train. He switched to Apple from a BlackBerry about a year ago, after becoming disenchanted with the reliability and technological features of non-Apple smartphones. “When I got the iPhone, it worked so well that I told my friends, ‘Now I have a REAL smartphone,'” Green said. Associated Press writers Youkyung Lee in Seoul, South Korea, and Mark Jewell in Boston contributed to this report. Buying Home Beats Renting After Just 3 Years in Much of US. Is it better to buy a home or rent? An analysis released today by real estate information provider Zillow.com finds that in most of the U.S., buying becomes a better deal than renting after only three years of residence. In many metro areas, the advantage comes much sooner. In Miami, Fort Lauderdale, and Tampa, for example, owning beats renting after 1.6 years, the study finds. Zillow determined the breakeven horizon—the point at which owning becomes more financially advantageous than renting the same home–for more than 200 metro areas and 7,500 cities around the U.S. Unlike a simple purchase price-to-rent ratio, the breakeven horizon takes into account such other data as taxes, tax deductions, down payments, utilities, appreciation, maintenance, opportunity costs, and fluctuations in the rental market. The shortest breakeven horizons occur in markets such as Florida’s, where home values fell farthest during the recession. The ownership advantage there kicks in after less than two years. In other markets, however, where values have held, the advantage comes far later. In San Jose, Calif., for example, the time is a little over eight years. San Jose had the longest breakeven horizon of any of the 30 largest metro areas Zillow studied. Within metros, the study found big variations between one city and the next. In the San Francisco Bay Area, for example, a homeowner breaks even after 8.8 years; while in similarly-priced home in Menlo Park, the time required is a bit over 14 years. Metros with the longest horizons (besides San Jose) include Oak Harbor, Wash., and Santa Cruz, Calif. Those with the shortest include Memphis and Fernley, Nev.
Gudell says it would be a mistake to conclude that buying always is the better option. Everything depends, she says, on the metro area and the length of stay. For lots of folks who occupy their home a year and a half, renting remains, she says, “a solid option.” In the right metro, it even can pay off for persons staying as long as five or six years. The table of metro areas is on the next page.